Next morning we rise to an early autumn frost, evidence that we are indeed far North and before long the dusty streets will be enveloped in a six month long snow fall. With a chill in the air we head to one of the old gold mines. 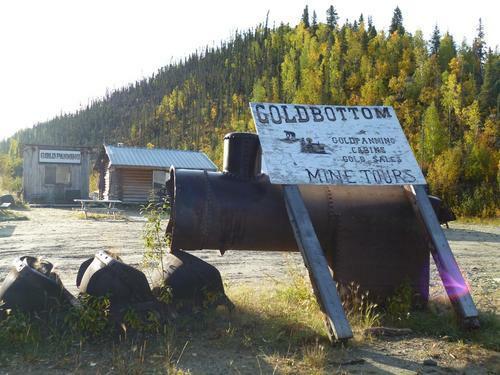 This is where Dawson City came from, gold! Even now there are still gold mines in operation and whilst the heady days of inch size nuggets are long gone, money can still be made and this mine is still in action during the summer months. 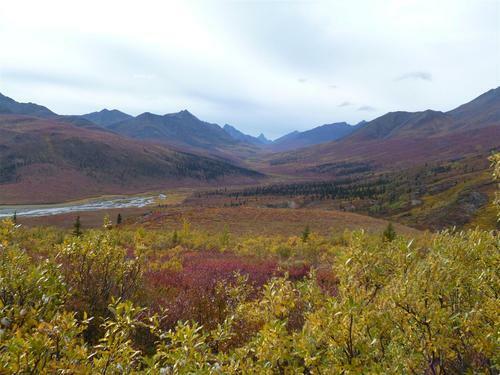 We learn about the perils of “permafrost” (which I won’t go in to for fear of boring you senseless) and how the harsh environment made prospecting here so challenging, then wade in to the river with our bowl of gravel in hand to make our own fortune. After 15 minutes I spy the merest glint of gold at the bottom of my pan and as all the gravel disappears back to the river I have 3 specs of gold which I triumphantly have put into a tiny vile to take home and keep. 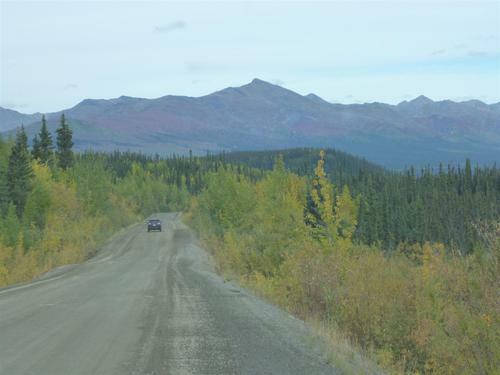 Gold adventures over we hit the road again and this time we’re heading for the Dempster. I insist on taking the wheel as the tarmac turns to dirt road and we wind our way North along the highway. We’re heading into Tombstone Territorial Park. With towering jagged peaks and huge valleys this it is an awe inspiring site as we get closer. The skies are so big here too, the awareness of freedom and space is palpable, it’s amazing, it’s invigorating. We are here in autumn and are treated to the most beautiful colors, pinks and reds adorn the slopes and brush around us, we’re all keen to get out of the cars and head into this wilderness and after a quick stop for lunch, a scrummy cheese fondue created by our French guide, Gerard, we head for the hills for a gentle romp up to a spectacular viewpoint. We are on a gentle stroll compared to many of the intrepid hikers of this area. There are hut-to-hut hikes of 4 or 5 days that take the more adventurous high up into the park for the most enviable viewpoints of the valley and the most isolated spots. This is real wilderness country and it’s vastness and our vulnerability to it’s elements is humbling. Back to Dawson for one final night and we all sleep well after the fresh air and adventures of the day. We wake early and after a brief explore of the visitor center and a little more Klondike history we continue our road trip. Today is once again all about the driving and will take us high up along the “Top of the World” highway. Not for the faint hearted, there are a fair few hair raising drops in places so careful driving is a must. Today there is no civilization for hundreds of kilometers, in fact nothing at all in Canada. We must cross the border into Alaska today at surely the most remote border crossing in North America. After a bit of friendly banter, the crossing officials soon warm to us and wish us a great journey as we continue on our way. 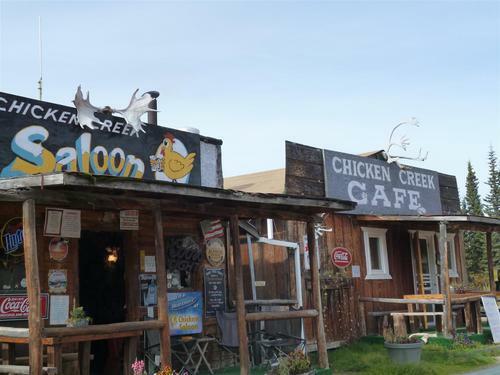 We will be in Alaska for only a few hours but it spices up the day and we head for our lunch stop, the sprawling metropolis of Chicken. So called as the prospectors that once lived here wanted to name it Ptarmigan after the feathered creatures that wondered around them there, but couldn’t spell it so settled for Chicken instead. Consisting of a gift shop, pub and small café, it’s a brief stop for heart fare and hilariously inspired gift opportunities before we head off again. One more border crossing and we’re back in Canada once again, heading for Beaver Creek for the night. Weary but enthused from the day’s drive, we head to bed early, there’s not a lot here, our beds are calling. The next day takes us South once again. 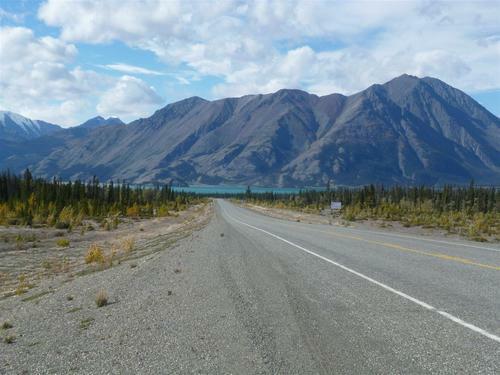 Today we’re heading for the Kluane National Park. Home to some of the tallest peaks in North America we are soon treated to snow capped mountains and the deepest turquoise lakes. A screeching halt by our second vehicle alerts us to the possibility of a wildlife spotting. Indeed, there is a moose grazing by the edge of the lake. He is far away but fascinating to watch as he ponders the water ahead of him then turns and gracefully heads back into the bush. We continue on to Kluane, planes await us to soar us high above the mountain tops and into the park for the most awesome icefield views. I say we, although I must admit at this point that I did not take to the skies myself, being a somewhat nervous flyer, the thought of being in a small plane soaring toward the mountains was a little too much and I watched as my compatriots climbed aboard and disappeared into the air. An hour or so later they were back, buzzing with stories of ice fields, bright blue glaciers and staggering mountain peaks. It sounded amazing, I was a bit sad for not going but happy that they had such a great experience. After a night in Kluane it was time to head back to civilization. After 5 days in the veritable wilderness I’m surprised how little I feel the need to be back in town, I could stay here amongst the fresh air, open spaces and fascinating locals. I’m in no hurry to go back to reality. But return we must, with a little side trip along the way. We’re heading to Muktuk kennels, a working sled dog kennel about 20 minutes outside of Whitehorse. Home to over 120 working dogs, it’s a pretty noisy place with all the dogs enthusiastically greeting our arrival with a rowdy barking frenzy. During the summer months they are rested so daily exercise involves a run down to the river for a splash about with guests visiting. Around 15 dogs are selected for each run with guests and we watch them bounding ahead of us excitedly as their keepers tell us all about the kennels and the dogs. It’s a fascinating talk, they are passionate about the dogs and know them all individually, we’re encouraged to fuss and get to know the dogs ourselves and find them to be a really friendly affectionate bunch. 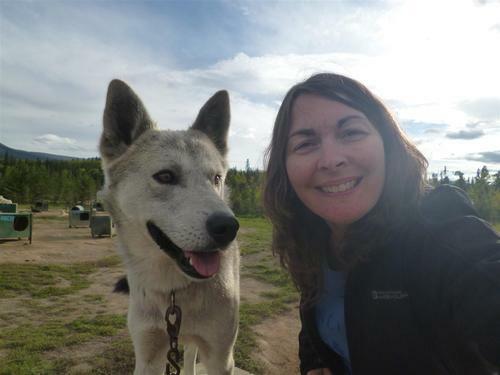 We learn all about the dog mushing experiences in the winter and how the kennels have been involved in the “Yukon Quest” a gruelling 1000 mile dog sledding challenge from Haines Junction in Alaska to Whitehorse which takes place in February next year. These dogs are truly amazing and I’m tempted to give up my day job and move out here full time to become a dog musher myself! I wouldn’t be the first, there’s something amazingly captivating about them. Alas our adventure is drawing to a close, we return to what now seems to be the metropolis of Whitehorse. What seemed a quaint country town less than a week ago now seems big and noisy and overwhelming… take me back to the wilderness, back to the parks, back to the big skies, don’t make me go home!! !